The New Voice Team congratulates Melina Egloff on her successful apprenticeship! Home » Blog » The New Voice Team congratulates Melina Egloff on her successful apprenticeship! KV Zurich Business School (KVZBS) once again recorded a pleasing overall result. The award for best graduation went to Luca Rütimann. 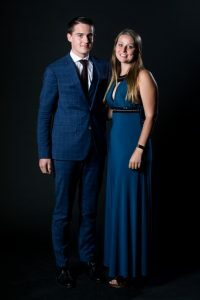 With an overall grade of 5.7 in the EFZ and a grade average of 5.4 in the vocational maturity certificate, the businessman from Affoltern am Albis, who completed his apprenticeship at Credit Suisse AG, achieved a top result. Melina Egloff (New Voice (Switzerland) Ltd) from Zurich with a final grade of 5.6 in the Swiss Federal Certificate of Competence (EFZ) was also pleased to receive a top result. Thus, she was the best of her year of Advanced Basic Education and thus earned a placement in the federal rank. In total, 60 graduates achieved an overall grade of 5.3 or more, placing them in the Swiss federal rank. The young merchants were allowed to receive their certificates in an impressive setting in the Zurich Hallenstadion. A total of 4,500 guests, including family members and friends, vocational trainers and teachers participated in the ceremony. Congratulations and inspiration for the professional future delivered guest speaker Nadia Schildknecht. The head of the Zurich Film Festival, which has also laid the foundation for her successful career with a KV apprenticeship, encouraged aspiring merchants to believe in their goals and to work with all their hearts and with an iron will to do so. But it is especially important to never stop and to keep developing. We wish her continued a successful career as she had with us. Happy about their top result (v.l): Luca Rütimann and Melina Egloff.